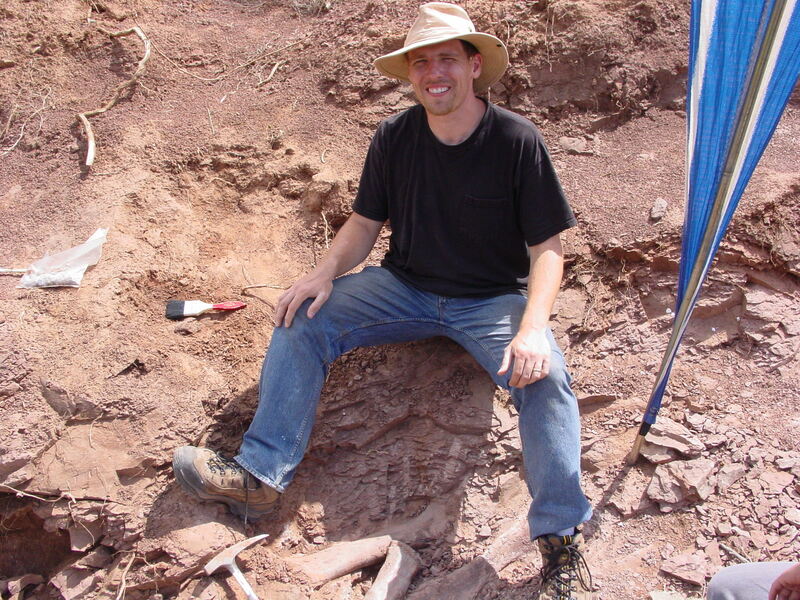 The Evolving Paleontologist | Digital Home of Dr. Matthew F. Bonnan, Ph.D. In a recent Washington Post op-ed, Robert Gebelhoff suggests we recognize that science is far from unassailable and easily twisted to push various political agendas or to bolster our own particular world view. Gebelhoff then points to a variety of ways that science has been misused, and concludes by suggesting we refuse to have opinions where we don’t have a clear answer. Whereas we should all be skeptical of proclamations from authority, Gebelhoff is far from alone in missing key aspects that give science its power. Let’s start by asking, what do you mean by “science”? Often nebulously imagined as a search for ultimate truth, science is no more nor less than the best tool we have for answering questions about the natural world. Ideally, those who do science abide by strict rules of conduct. Your hypotheses, laws, and theories must be testable, falsifiable, and predictive. Your claims are only valid if you have data to support them. You recognize your own inherent human bias and so have your work evaluated carefully by experts, a process known as peer review. If your peers and others cannot replicate your observations or experiments, the burden falls on you to either provide more evidence or reject or modify your conclusions. Ultimately, the data decide. Science is a tool, but it is used by humans and that means that it will never be “anywhere near perfect” as Gebelhoff laments. This is certainly true, but ignores the fact that it is typically scientists themselves who catch errors and correct them. As is often said, science is a self-correcting discipline: if data keep piling up that contradict previous or current hypotheses, we reject the old and embrace the new because it is closer to what actually occurs in nature. Being truthful may not hold much currency in some human affairs, but if you lie and distort your data in science, sooner or later you will be found out and it will almost certainly mean the end of your career. Believe me, peer review is not for the faint-hearted. Yes, science is not perfect. But this misses a crucial concept: there is no absolute certainty in science — there is simply probability. As scientists we recognize that we are human and can only realistically deal in samples. For example, when it comes to climate change, we simply can’t have all the data on all the clouds, carbon dioxide, and local temperatures everywhere and always. Therefore, we indicate that our data suggest certain scenarios are more probable than others. The higher the probability, the more confident one can be that the predictions will come to pass based on the data. Here we get to the root of so many problems at the intersection of science and politics. Especially now, many of us have taken rigid political sides and we hide behind our identity bunkers, secure in the knowledge that our politics are the right ones. Recognizing the authority of science, but failing to understand where that authority comes from, we cherry pick and twist what we have read about science to aid our fight. Few people go beyond a news blurb, Facebook post, or tweet, and rarer still do we read what the scientists actually reported. In other areas of politics, we can easily deny the significance of scientific findings by turning the nature of science itself on its head: until we can be certain, we claim, there is no need for action. How often have you heard something like, “Let’s just wait until all the data are in, and then we’ll make an informed decision.” This is simply a way to deny significant findings and to wait forever, potentially putting us in harm’s way. Perhaps the most frustrating assertion in Gebelhoff’s article is that since the U.S. government spends billions of dollars on non-defense research each year, “with so much money at stake, it’s simply unrealistic to expect all scientists to act purely for the advancement of knowledge.” These sorts of statements really hurt those of us for whom science is not just a profession but a vocation. First, Gebelhoff’s claim that “$70 billion” is spent on non-defense research is misleading. Yes, in 2016 approximately $70 billion was spent on non-defense research and development, but it is “folded into the budgets of more than two dozen federal departments and independent agencies, and there may be little or no distinction made between activities” (https://www.aaas.org/fy16budget/federal-rd-fy-2016-budget-overview). Furthermore, as an example, in 2015 the total U.S. government budget was approximately $1.1 trillion, and science funding accounted for only 3% or about $30 billion of that money. Second, the majority of the money is often spent on supporting and training students and postdocs, as well as (rightly so) public outreach and education. Most scientists, if they ever receive this highly competitive funding, are not rolling in cash. Only 20% of the grant requests the National Science Foundation receives are funded each year, and the average annual award is approximately $160,000. Think about that – the average annual grant award for supporting students, buying equipment, publishing the results for the public, and doing outreach is less than the average annual salary of a medical doctor in the U.S. The truth is, if you want to be a rich scientist you pursue a career in the private sector. Gebelhoff is correct – science is not perfect and its conclusions can be twisted to justify political ends. But this is no reason to lose hope in the power and benefit of science as a tool. Recognizing that our politics often distort the nature of science, we must stop expecting science to give us absolute certainty to justify our preconceived notions. Instead, we must struggle to remember that science is an apolitical tool for understanding nature. It is powerful in that it helps us predict, often very accurately, the likely outcomes of our actions here on earth. Science doesn’t care about your politics, but like all tools, it can be bent toward noble or ignoble ends. Let’s choose wisely. Today on the first full day of a new presidential administration that has already pivoted in digital media to downplay or possibly scrub climate change from the national conversation; and to join other scientists concerned with support of science including the science of climate change #USofScience, I am reposting my older post on science and climate change from a few years ago. The message is as relevant as ever. Climate change is real. 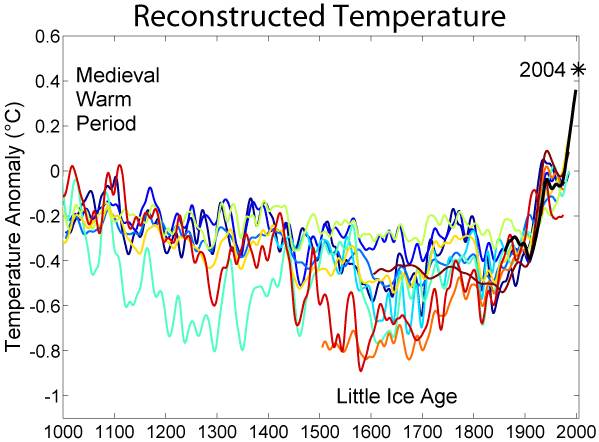 The rapid climate change documented in recent history is tied to human activity. No amount of political argument or wishing it away can change that. I say that as a former climate change denier. I emphasize that climate data are what they are — carbon dioxide doesn’t care whether you are a Democrat, Republican, or Independent. Rapid climate change is occurring, and humans have played a role. What follows is my original and slightly tweaked post. As the National Center For Science Education has been demonstrating for some time now, denying biological evolution and denying climate change are part of a larger phenomenon related to science illiteracy. But I think we often tend to conflate the knowing of scientific data with knowing the process of science itself. As a college professor, I can tell you that smart students who know a lot about the natural world don’t always actually know the process of science. In one of my first lectures to undergraduates in the introductory biology majors course, when I press them to define science, hypothesis, and so on, very few can. And I have come to believe that our current societal issue with accepting science is a fundamental misunderstanding of the process, not simply a dearth of facts. In my undergraduate days, I was a climate change denier. That’s correct — I felt that the evidence was at best equivocal for global warming. If you couldn’t prove it directly, how confident could we be? In fact, I felt a good amount of the environmental “science” out there was nothing more than misplaced hysteria or political propaganda. For those who do know me and my political leanings, you are probably surprised. So I speak from experience when I say that I understand the reservations among many people when it comes to climate change. Ask any climate scientist, and they will never tell you with 100% certainty that their predictions will come to pass. In fact, these scientists rely on models of climate, and those models are a hypothesis of reality, not reality itself. Remember, I was a science major with aspirations of becoming a paleontologist, so my undergraduate self decided that if we couldn’t be certain, we shouldn’t go around broadcasting that it was the end of the world. In my undergraduate head, the best science was certain, and that was why paleontology was so difficult — a lot of uncertainty. So here’s the thing — a climate scientist can show you a lot of data (see below), and can tell you based on their expertise which are the most probable outcomes of current trends, but if you were my undergraduate self, you would not be convinced. Whether or not my younger self (let alone my older self) was stubborn or simply a bit daft (probably both), I again point out a key feature in the thought process: if it isn’t certain, it’s not good science. So, the assumption or implication that good science is certain is the first part of the puzzle. The second part of the stubbornness by many of us to accept climate change or perhaps biological evolution is that we want evidence presented in a court room. We want the TV show Law & Order, and we want the good lawyer to give us an iron-clad argument, or to show that our opponent is a lesser person, or to literally give us a smoking gun. We are convinced that science works like this, and that the person with the best argument and evidence wins. And most importantly, that the winner stays the winner. Nothing can ever overturn the win. Good science should be certain and win the day’s argument, for now and forever. But of course, science has little or nothing to do with certainty and court room drama. There is no certainty in science — there is simply probability. Because a good scientist recognizes that we are only human, and we can only realistically deal in samples, we can’t measure every aspect of the known universe, and we certainly can’t have all the data on all the clouds, carbon dioxide, and local temperatures. Therefore, a good scientist will never say they have “proved” something — rather, they will indicate that their data suggest certain scenarios are more probable than others. The higher the probability, the more confident one can be that the predictions may come to pass. It took a while for this concept to sink in with me. It took graduate school and having to do science, and taking an excellent seminar from Professor Emeritus Ronald Toth at Northern Illinois University, that finally made science as a process click. That means, as someone who earned a B.S. in Geology with a Biology major, I had no real concrete idea about science as a process! I am not surprised nor judgmental that many of our undergraduates, let alone the larger public, don’t understand this either — but this I believe is what needs to be most addressed. Even if you do succeed in uncovering something new or accurately predicting a trend, there will always be new data. The complaint you often hear about science is how we keep changing our damn minds — we knew Pluto was a planet, or we knew that birds were not dinosaurs, or we knew that cholesterol was bad, and so on. But the process of science requires that one keep testing the hypothesis, and to incorporate new data as it comes in. So we’re not changing our minds to tick you off — we adapting our models and our understanding of the natural world as more data come rolling in. What I realized at long last in graduate school was that scientists speak in probabilities. And when you think about it, we deal in probabilities all the time, and we make decisions based on those probabilities, and we are okay with that. Every time you get in a car, there is a probability you will be in an accident … but you probably still get in that car. Imagine if someone told you that unless you could 100% guarantee that no accidents would ever occur, it was pointless to drive. Okay, but now for something more ominous: what about the probability that you will get sick if you ingest salmonella bacteria. I have been sickened myself by this nasty “bug,” and many people have died from salmonella poisoning. But there will always be cases where someone ingests salmonella or another pathogen and doesn’t become sick. Now imagine a friend tells you that since every time a person has ingested salmonella they haven’t always become ill or died, we don’t have enough data to know whether or not it is truly deadly. Therefore, wasting money and resources on preventing the spread of salmonella is not advisable because we can’t know with 100% certainty that everyone who ingests it will get sick or die. This person would probably not remain your friend for long. Probability in science works along this spectrum — from low to high odds. Low odds: you will be hit in the head and killed by a rouge meteorite tomorrow. High odds: the climate will continue to change, with an overall trend toward higher global temperatures. Can we be certain climate will change in these ways? Not 100%. But the probabilities are high … and that’s why we should be concerned: the scientific predictions of increasing global temperatures suggest our world will change in ways that, if we are not prepared, will be devastating. Of course, we could wait until we’re certain, and we could wait for the ultimate court room battle of the sciences … but if the probabilities are high, why wait? What are waiting for? Waiting for all the data to come in (which will never happen) and waiting for 100% certainty (which will never happen) is simply another way of doing nothing in the face of probable danger. If you understand that the process of science is by its very nature is one based on probability, not certainty, I think we begin to get to the heart of the scientific illiteracy problem. Giving people more and more data won’t help if they sincerely believe that uncertainty means no one knows anything. This is, I believe, the core issue with science literacy — and why our politicians, our media, and our public are so often mislead to disregard good science and its important predictions that effect us all. Due to requests for a sampler of my forthcoming book from Indiana University Press, The Bare Bones, I am now making available a PDF of the first chapter. I think this will give you a feel for the tone of the book. Thanks to everyone for all of the interest and enthusiasm for the book. It was truly a labor of love, and I hope many of you will find it enjoyable to read and useful to those who may use it as an educational resource. Carnivorous mammals, such as a cat, tend to have a jaw joint in line with their sharp, shearing teeth, much as the handles of a pair of scissors align with the blades. This puts the best cutting surface towards the back of the jaws. In contrast, herbivorous mammals such as horses have a jaw joint located above the tooth row, allowing their teeth to simultaneously contact one another like a nutcracker. Also remember, you can preorder The Bare Bones through Indiana University Press or Amazon. If you are into e-books, it can also be purchased as an e-book. See the Indiana University Press website for links to the appropriate retailers. Artist’s reconstruction of Pulanesaura by Gina Viglietti. I am happy to report on a new sauropod dinosaur from the Early Jurassic of South Africa! The dinosaur, Pulanesaura, was discovered in 2004 and has been a long time coming to press. Now, she’s finally here. I was five years old in 1978. Fast-forward to the fall of 2004, and my 31-year-old self is standing in the rain at Spion Kop farm in the Free State of South Africa marveling at the large limb bones poking out of a section of the upper Elliot Formation. I don’t recall having lunch at that moment, but I do remember being excited, and being grateful that I was part of a team, headed by Adam Yates, charged with exploring these Early Jurassic rocks. National Geographic had sponsored our grant to pursue promising bones issuing forth from these rocks, and although we did not immediately know we had a new dinosaur, there was a good possibility we did. Myself above two tibia bones (tibiae) from what would become known as Pulanesaura in 2004 … it was a less rainy day that day. Why South Africa? As it turns out, South Africa has many exposures of Lower Jurassic rocks that record a very significant time in dinosaur evolution. The earliest true dinosaurs appeared in the Triassic period about 235 million years ago (Ma) but remained relatively small to medium-sized animals that were in competition with other vertebrate groups vying for dominance in a harsh world. During the Triassic period, all the continents were amalgamated into a single supercontinent dubbed Pangea. Although to a modern traveler the thought of Pangea sounds amazing (imagine riding a train from North America over to Europe or driving from South America into Antarctica, Africa, or Australia), ecologically this was disastrous. A huge expanse of Pangea was landlocked and nearly devoid of water, making it both hot and uninhabitable. Moreover, sea levels were also drastically lower, creating fewer areas for marine life to thrive. Thus, Pangea took a huge toll on the animals that preceded the dinosaurs. In fact, the largest mass extinction in the past 540 million years occurred just prior to the Triassic period, wiping out a majority of life on the planet. During the Early Jurassic (starting about 200 Ma), Pangea began to unzip and break up into separate landmasses, and part of the effect of this was to bring water into regions it hadn’t been in millions of years, supporting more plants and, in turn, the animals that fed on them. It is also at this critical juncture that the sauropodomorph dinosaurs began to become larger-bodied and more diverse so that by the end of the Jurassic period (about 145 Ma), many of these herbivores were tipping the scales at 20-30 metric tons! 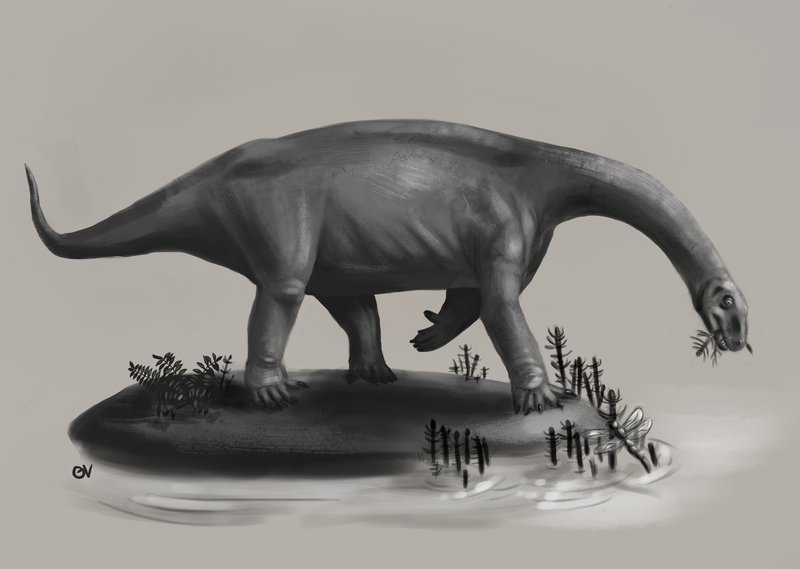 Sauropodomorphs started out as small to medium-sized bipedal herbivores that used their long necks and grasping hands to consume foliage at different heights in their environment. Sauropods became fully quadrupedal giants with elongate necks that acted as efficient food-gathering feeding booms, sweeping across swaths of vegetation while the herbivore stayed put. And this transition from mostly bipedal herbivores eating with their hands and necks to giant quadrupeds that relied solely on long necks to feed occurred right around the Early Jurassic period about 200 Ma. So, if you want to understand the beginnings of this trend towards gigantism in the sauropodomorph dinosaurs, you need to search for fossils in Early Jurassic rocks … and that brings us back to me standing in the rain at Spion Kop on the upper Elliot Formation staring at the large bones coming out of the ground. 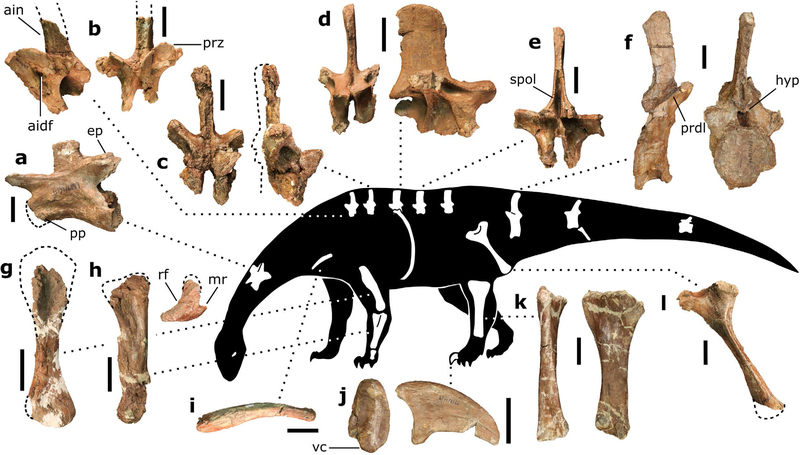 Those bones we were unearthing would end up being a sauropod new to science named Pulanesaura that my colleagues and I have published on this week in Nature Scientific Reports. The lead author, Blair McPhee, is a Ph.D. student at the University of Witwatersrand in South Africa who took on this dinosaur for his dissertation. Remember that we discovered Pulanesaura in 2004? Why didn’t we publish on this animal earlier? For a number of reasons collectively called life. Between 2009 and 2011, we did publish on two other sauropodomorph dinosaurs from Spion Kop, so that took up some time. But more significantly, Adam Yates and I had major life-changing moves to new employers: Adam to the Museum of Central Australia in Alice Springs; me to Stockton University. And so poor Pulanesaura was languishing. Therefore, when Blair approached us about describing Pulanesaura for his Ph.D., we were enthusiastically supportive. I was especially pleased to see Blair at the helm of the description. I am beyond happy that a South African Ph.D. student is the lead author on the description of a native South African dinosaur. His persistence and perseverance on this project is why the world now knows about Pulanesaura. Why Pulanesaura? Well, the name means “rain bringer” in Sesotho, which is fitting since we always seemed to get rained on during the excavation of this dinosaur. And the publication of “Rain Bringer” has finally brought home a trilogy of sauropodomorph dinosaurs and the complex story they tell of what was happening in the Early Jurassic at what is now the Spion Kop farm. 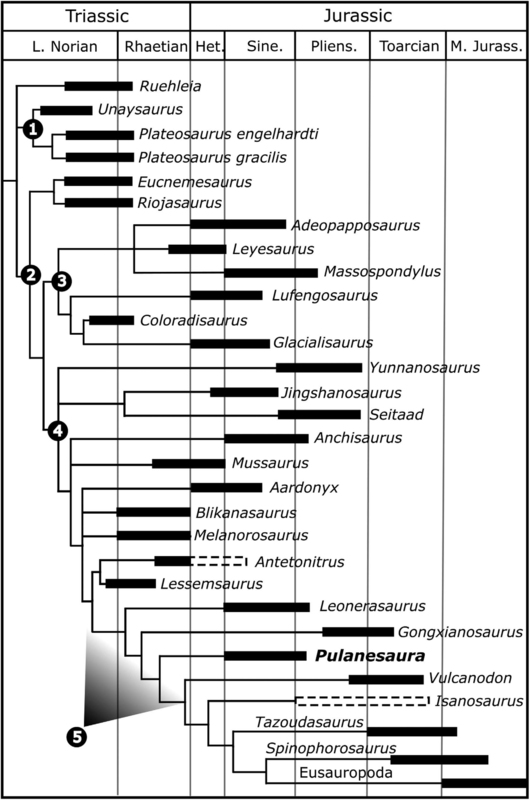 First things first – how do we know Pulanesaura is a sauropod? A number of clues point the way. For one thing, although we did not find a skull, we found teeth. The teeth of sauropods, unlike their sauropodomorph brethren, have a spoon- or spatula-like profile and have wrinkled enamel. The teeth of Pulanesaura certainly fit the bill there. Next, being large, sauropods braced their vertebral column with extra joints in their backbones (vertebrae) – a portion of this extra joint is called the hyposphene. The body vertebrae we have of Pulanesaura only preserve their tops (the hyposphene is located on the bottom-half of the vertebra) but luckily a full tail (caudal) vertebra is preserved, and that has a hyposphene. We are also fortunate that part of the forelimb was preserved. The ulna bone in sauropods cradles the other forearm bone, the radius, by wrapping around it from behind. In sauropods, a wide, triangular depression is present on the ulna where the radius sits. Although the ulna of Pulanesaura is a bit crushed and scrappy, it was intact enough to show that, yes, indeed, such a depression for the radius was there. These features and more showed us that this dinosaur was certainly a true sauropod. The known skeleton of Pulanesaura. How do we know Pulanesaura is new to science? Using a method called cladistics, the suite of features for Pulanesaura was compared to other sauropodomorphs and sauropods from South Africa and around the globe. Its unique combination of features show that it is not a member of previously known sauropodomorph or sauropod dinosaurs, but falls along its own branch of the dinosaur family tree near the common ancestor of all sauropod dinosaurs. At the moment, it is very difficult to tell the difference between a true early sauropod and a sauropodomorph very close to the common ancestor of sauropods. Given the data we have for Pulanesaura, we find it most likely to be a very early sauropod. Certainly, future studies and perhaps more material of Pulanesaura will clarify this picture. Where Pulanesaura falls on the dinosaur family tree. How big was Pulanesaura? We certainly don’t have a complete skeleton of this herbivore, but we have enough bones from enough areas of the body to infer that this animal stretched nearly 8 meters (about 26 feet) long and stood about 2 meters (about 6.5 feet) high at the hip. That may seem big, but it’s small for a sauropod. Why is Pulanesaura significant? The traditional picture of sauropodomorph evolution is that when true sauropods came onto the scene, the other sauropodomorphs were pushed aside, their small body size and “inferior” anatomy undone by the larger herbivores. But Pulanesaurua turns this notion on its head because, living alongside it at Spion Kop were other sauropodomorph dinosaurs with very different anatomies. Adam, Johann, myself, and others have described two of these other sauropodomorphs, both also from Spion Kop. One, Aardonyx, was a 7 meter long sauropodomorph capable of assuming both a bipedal and quadrupedal posture; and another, Arcusaurus, was a small, juvenile sauropodomorph with a hold-over of more primitive features. And one of the things these other sauropodomorphs had going for them was that they could feed at different heights and use their forelimbs to direct foliage to the mouth. In contrast, the anatomy of Pulanesaura shows that it was an obligate quadruped (it could not stand bipedally on its hind legs), which would have restricted its vertical reach for vegetation compared with these other sauropodomorphs. However, the single neck (cervical) vertebra we have for Pulanesaura has joints that were spaced and angled (much like those of other sauropods) such that they would have allowed for a larger range of neck motion than in other contemporaneous sauropodomorphs. In other words, although Pulanesaura could not rear up and extend its neck into the trees, it could stand still and more efficiently crop foliage over a wider range. We suggest Pulanesaura shows us the incipient stages of what sauropods became very good at: they stood in one place and swept their tiny heads across a sea of vegetation. As the Jurassic period wore on, and vegetation became larger and more widespread, the advantages conferred by a body which conserved energy by standing still and sweeping a long neck across swaths of plants would ultimately select for sauropods and not their bipedal cousins. It would have been difficult to explain to my five-year-old self that it would be many lunch breaks from the initial discoveries at Spion Kop to their final reveal to the public. But it has been worth the wait. I consider myself to be very fortunate to have the privilege of working with so many enthusiastic and talented people. Moreover, it is important to stress that cooperation with the farmers at Spion Kop was invaluable. Partnerships with farmers are a great benefit to paleontology in South Africa. Farmers know their land well, and they’re always spotting interesting things. It’s such a pleasure to work with people who value their heritage and to help them learn more about it. Because of such mutual respect and interest in South Africa’s prehistory, we now have a much richer picture and appreciation of a pivotal moment in sauropod dinosaur history that would not otherwise be possible. And my inner five-year-old most certainly approves! This Fall term I am teaching my dinosaurs course, but with a twist – it is a freshman-only seminar, and while we will cover dinosaur paleontology, the course is also designed to expose students to how science as a tool and culture intersect. For our first-year students, we assign a common reading, and this year’s reading is Whistling Vivaldi by Claude Steele. This excellent little book shows how pervasive stereotypes are and how they affect our identities. There are certainly many stereotypes surrounding scientists: when I have asked students to draw a scientist in previous courses, I almost always get a balding, white male with a lab coat and a test tube. This is problematic, because missing the provenance information makes the fossil far less informative. Although it may provide insights into snake evolution, without tighter controls on where and when in time the fossil was deposited, we have lost a lot of environmental context and its temporal relationship to other snake fossils. This is one of the reasons why, public or private, fossils collected without appropriate provenance information lose much of their scientific value. What is more problematic than the scientific issue of provenance is the legality of the fossil in question. Brazil has laws which prohibit Brazilian fossils from leaving the country, and this suggests Tetrapodophis amplectus ended up in the private collection (from which Bürgermeister-Müller-Museum obtained it) illegally. The reasoning behind such laws stem from concern by Brazilians that their natural heritage is being expatriated, which adversely affects Brazilian paleontologists studying and reporting on their own fossils. For a sociological perspective on this last, abhorrent statement, see Jess Bonnan-White’s post on this issue. It is time we move past such blatantly colonial and derogatory attitudes about fossil provenance in vertebrate paleontology, and that we call out those who believe it is okay to continue to express such attitudes. Martill’s language exudes overtones of colonial Europe and America, that mostly white, male scientists are in the best position not only to understand nature but to take what they please from others they deem less human. And whereas Martill’s voice may be among the loudest, it certainly is not the only voice extolling these “virtues.” I have myself been told that it is best for those of us in first-world countries to get and prepare fossils from other places so that the science is done right. And that is perhaps the most galling thing of all: that in the end, we pretend that this is all just about making the science right. That we perpetuate this myth of “pure science.” That, in the end, this is just about a remarkable fossil and nothing more. That because we are scientists we have the luxury of not giving a damn about anything other than the science. That we don’t have to consider other peoples, their customs, their laws, their cultures, or their right to their own natural history. When you say, “Personally I don’t care a damn how the fossil came from Brazil or when it came from Brazil. These are irrelevant to the scientific significance of the fossil,” what you are really saying is that science matters more than people. Science is a tool, but its application is far from neutral. Science is done a huge disservice when its usefulness as a tool for understanding nature supersedes that of understanding and respecting our fellow human beings, let alone our fellow paleontologists. You don’t get to ignore laws and promote the expatriation of fossils from other people just because you are doing science. If we truly care about global natural history, and we truly care about the story the fossils tell, then we must come to terms with the fact that whereas fossils know no political boundaries, humans do. Thus, it is in our best interest as scientists to be more global in our appreciation of other countries and other peoples. If you are interested in Brazilian fossils, you should also be interested in Brazilian people, their politics, and their laws. If we truly believe science is an egalitarian enterprise where someone’s merit as a scientist comes from their ability, not their nationality, then we can no longer tolerate the excuse that science trumps all. As a dinosaur paleontologist, I was perhaps duty-bound to see Jurassic World … that and my 10-year-old daughter was keen to see it as well. I am teaching a freshman-only seminar on dinosaurs this fall, and that also made the choice to see the movie a no-brainer. I had only seen one or two brief previews of the movie and had avoided reading reviews of the plot so I could go into the movie with as few preconceptions as possible. Here are my thoughts. Before I start, let me say that this is not a review of the story or much about the accuracy of the science. That has already been done in multiple ways by many of my colleagues in the dinosphere. There is not much new I could add there. Therefore, there are no spoilers here unless you consider what is shown in the movie previews as spoilers. I was not surprised and kind of disappointed by I what I saw. In a sentence: it was a monster movie and not a movie about dinosaurs or science. There were no paleontologist characters in the movie, and the dinosaurs were there to devour people and cause mayhem or serve as background. As anyone would know from the movie previews, this is again a retread of technology gone wrong and hubris. No one should be surprised by the basic plot and its outcome. So here is my question: since this movie is clearly not about science and is, like the original Jurassic Park, yet another Frankenstein story, why should we as scientists care how accurate is? And I ask this question because we dinosaur paleontologists suffer from a public image problem. We are often considered to be kids who never grew up, but not “real” scientists. I am the first to admit that my fascination with dinosaurs started early, and that many of us have a friendly competition to see who was interested in dinosaurs the earliest. It does come with a certain badge of honor. But I think that outside of our small group, this doesn’t often help us be taken seriously. I suppose, for example, one could point to someone like Neil DeGrasse Tyson, arguing that he engages the public with his take on science-fiction movies. But even here astronomy and physics have more science “street cred” than dinosaur paleontology. Tyson can let his nerd flag fly, so to speak, without much “damage” to the reputation of physics because his science is “the” science in the mind of the public. Nobody (sane) argues about gravity. Everyone, though, is happy to argue with dinosaur experts about what they think dinosaurs were like … perhaps in part because we all know the science is done by big kids who aren’t real scientists. I agree and empathize with many of my colleagues that dinosaur movies often miss an opportunity to educate the public about science as a process as well as entertain. But I also think we tread a fine line here — one that may inadvertently only reinforce the stereotype of the nerdy (read “child-like” and “out-of-touch”) dinosaur paleontologist when we engage the “science” of a movie that is clearly not about science at all. This stereotype of the “big kid” dino-nerd is more damaging than just reputation. For example, the recent attempt to sell the privately-owned “Dueling Dinosaurs” was predicated on the identity of one of the dinosaurs as Nanotyrannus. Even when an expert on tyrannosaurids like Thomas Carr pointed out in great detail why Nanotyrannus is not real, it is perhaps easier to ignore his expertise in favor of profit partly because of the “big kid” stereotype. My suggestion would be, rather than engaging the press in the predictable “this and that were wrong” conversation, why not simply say, “this is science fiction and a monster movie and it doesn’t represent paleontology.” Jurassic World is about as close to dinosaur paleontology as Star Wars is to astronomy. These movies can be inspiring to children and adults, but their main focus is a story, its plot, climax, and resolution, not scientific accuracy. And the sad part about Jurassic World is that the missed opportunity is less about the science (which is relatively non-existent) and more about the tired re-hashing of gender stereotypes and hubris/comeupance plot lines. Dinosaur paleontology, for those of us who are experts, is a rigorous science with many insights to offer us in the present. And, yes, many of us have been enraptured with this science since childhood. There is nothing wrong with that. But understanding how stereotypes about our science and about us as scientists play in the larger world are equally important to recognize. We have an important message about the past and our future to impart to the public. Let’s not dilute our energies on the trivial details of an expensive and silly monster movie.